Safecraft, Two Zone Automatic Thermal, Includes Billet Cylinder/Roll Bar Mounts, 1-1/4" Roll Bar Mount Diameter. Safecraft’s Model AT is completely automatic, and contains two zone automatic fast-acting thermal sensors. 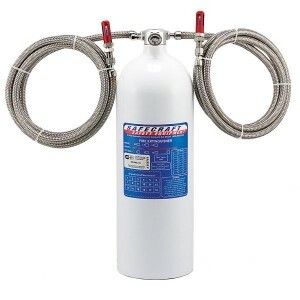 This model comes with 21 and 85 inch length hoses, and 1-1/4" diameter roll bar mount. For the ultimate fire suppression protection, the Safecraft Model AT system contains 3M™ Novec™ 1230 Fire Protection Fluid.